So, a nice bit of growth there but nothing explosive. What has truly gone up hugely though is the number of games on the website. 13 months ago, we had 380 games on the website, of which 76 had been added in the previous year. Now we have 980 games on the website in total – so 600 games have been added in the last 13 months. Pro-rated to a 12 month figure of 553, that’s an increase of 628% in game submissions. Note that in April 2012, I added the ability to publish games privately, which means not all of these 600 games are public. In fact, 297 of these are private (“unlisted”). But even if we only count public games, that’s still a big increase – 303 public games in 13 months, which if pro-rated to a 12 month figure of 280 is still a 268% increase. It’s also been really positive to see the site stats going up, loads of new games being created, and the forums getting busier. The new-look website which I launched a couple of weeks ago is doing well – it looks cleaner and more engaging to me, but more importantly the feedback is good and early indications from Google Analytics suggest people are staying longer on the site too. Finally, adding Gamebook mode to Quest turned out to be a good idea – it has enabled significantly more people to create an interactive story, and is I think largely behind the big rise in submissions over the last year. It feels like this may well be the primary game type in the future, which is why I made significant enhancements to it a couple of months ago for Quest 5.4. If you, like me, pine (a bit) for the heyday of text adventures, you should definitely check out First Times. 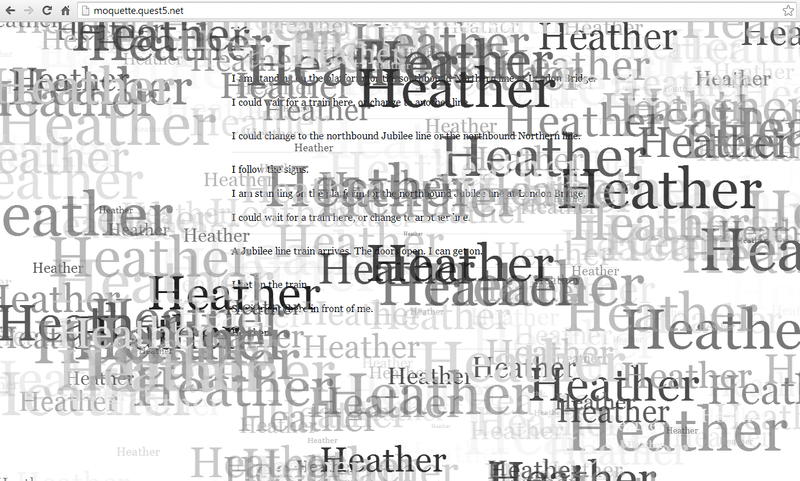 It’s a horror text adventure that kicks off with you waking up in a morgue, and without giving the game away, it’s genuinely creepy as you try to figure out what happened. If you’re young enough to be baffled by the term “text adventures”, ask your dad (but go north, open the door and hit the elf with the sword first). … and it was also an IndieGames freeware pick, but after an initial flurry the “long tail” is indeed long, and shallow. On iOS, First Times went from 2,280 downloads in March down to 252 in April – which is actually slightly less than the older app, The Things That Go Bump In The Night, which had 313. Interestingly, by far the most successful app I have released is the Windows Phone version of The Things That Go Bump In The Night – 1,168 downloads in the last month, and this is 9 months after its release. This is indicative of the decreased competition over on the Windows Phone Store, I think. It’s been great to add new translations for Quest into Italian, Portuguese and Romanian – bringing the total number of languages supported to 9. But very few games in these languages have been published yet – which is a huge shame as I know that text adventures would be a great resource for learning foreign languages. Clearly there is more work to be done here, both to make the Quest editor more usable by those who don’t speak English, and to set up the website to handle non-English games better – which may be as simple as adding language tags for easier searching and filtering. I was excited to hear about the Nesta Digital Makers open call – here was a body offering funding for projects to get young people making things, “to become creators, not just consumers of digital technologies”. To my mind, Quest is absolutely perfect for that. So it was hugely disappointing not to be shortlisted – or even to receive any feedback. It’s understandable given the huge interest Nesta had in the scheme, but it makes me reluctant to pursue this approach for getting Quest to pay for itself, as it takes time to put together these kinds of funding applications. Instead, selling products and services around Quest sounds far more sustainable and less risky to me. I know that there are schools out there using Quest, and offering services to them is one of my main focuses for the coming months. One of my current “areas for improvement” is simply identifying who these schools are. I can see from my web server log files that there are regularly groups of users from the same IP address using the web-based editor and playing games on the site – it would be great to know who you are, so please get in touch! That’s what I think, then – what have other people been saying about Quest over the last year-and-a-bit? It’s programming by stealth… It certainly sparked an interest in programming in a number of students… Try it yourself. Even better, get your kids to try it. Quest may attract the lion’s share of the IF market right now, but it still doesn’t produce much in the way of good games. “Quality over quantity” after all. Personally, I am perfectly happy for most of the games on the website not to match up to davidw’s standards. Some poor quality games are, I think, the price to pay for giving people accessible tools with which to build things and express themselves. Many users are young and are trying out writing and programming for the first time – we’ve all got to start somewhere. This site relies on user-submitted reviews to highlight what’s good – and authors value feedback too. So whether you like a game or not, be sure to leave a review! A timely online game and mobile app that packs humorous punches at Pakistan’s young and rich voters, some of whom say they will bravely dodge bombs to cast their vote next week, has been played by thousands of people. Karachi-based journalist Jahanzaib Haque created the game “It’s election time in Pakistan: Go rich boy go!” ten days ago on April 21, 2013. Now this is the kind of thing that excites me – give people tools which are easy to use, and see what they come up with. People who would never have created any kind of computer game before now have the ability to do so. This could be the beginning of a very interesting journey. Over the last year, it seems interactive fiction has started to take its first steps towards the mainstream. We have companies like Inkle releasing apps, and suddenly much talk about Twine. Playfic brought Inform into the browser and new platforms like Versu emerged. Crazy ideas are being tried out – like combining text games with something like Pinterest to create Dio. StoryNexus is powering a game from book publisher Random House which features in-app payments allowing you to do things like “expedite the narrative”. And check out the Choosatron. Stuff is happening here. I think Quest occupies a unique position among all this. 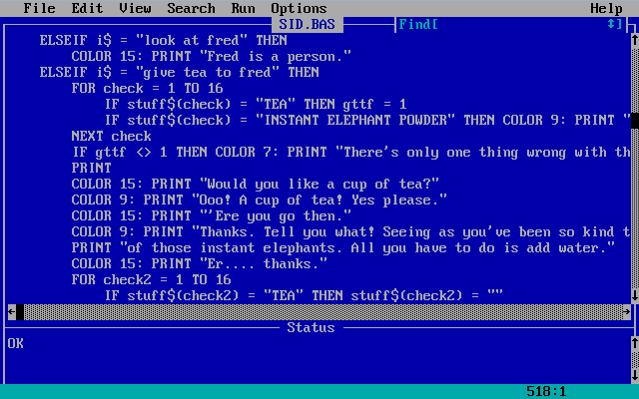 It encompasses both typing-based “old-school” text adventure games with a parser, and a newer style which is emerging based on hyperlinks that is closer to “Choose Your Own Adventure” than “Zork”. Will one style win over the other? Who knows – and I’m not going to be the one to prescribe exactly how people should interact with your game. We’re all still figuring this stuff out. 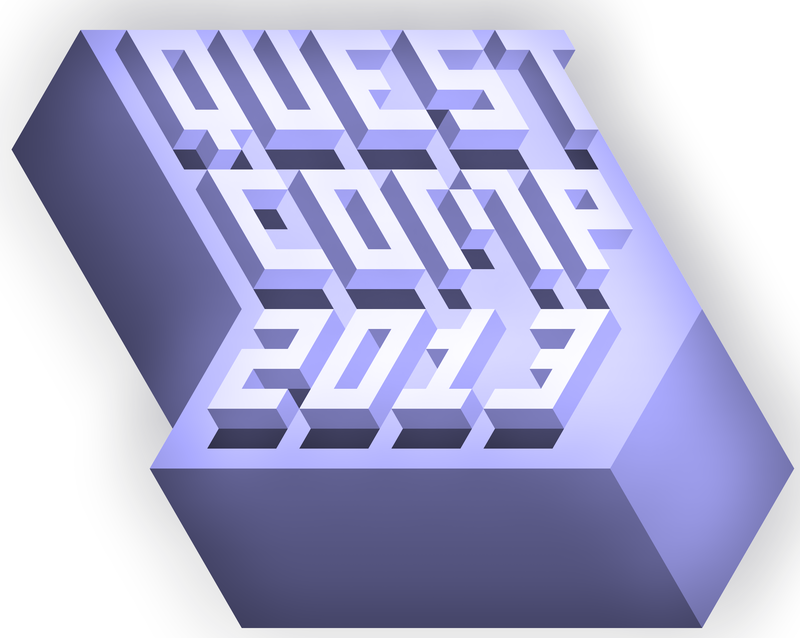 Perhaps more importantly, Quest is open source. 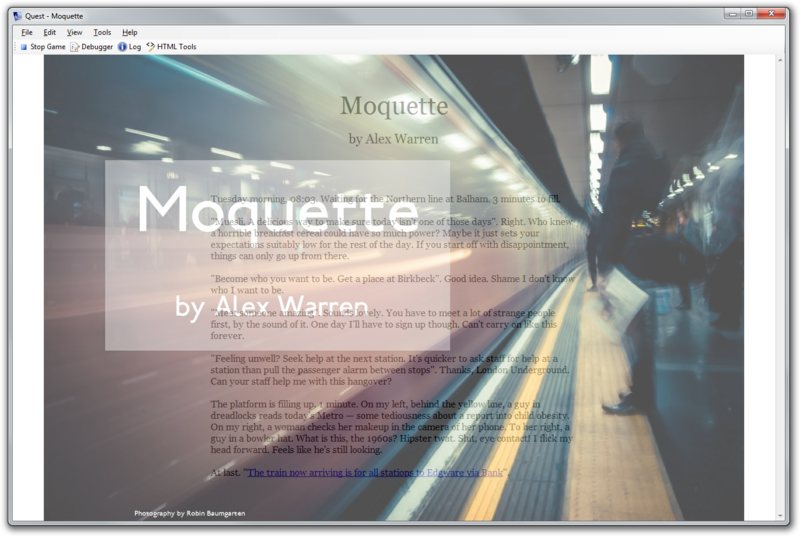 Anybody can get involved in the project, contribute code or translations, or even fork the code if they don’t like where it’s heading – go ahead, build your own interactive fiction platform, even make it closed source and expensive if you want. You are allowed to do this by the licence, and you’ll save yourself a load of work. The open source-ness also gives you security – Quest is not locked up inside one website, ready to disappear when a company runs out of money or their staff get acqui-hired. 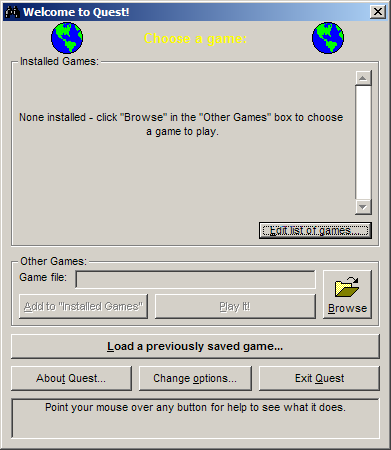 Even if textadventures.co.uk disappears or I spontaneously combust, the source code for Quest is available to be run somewhere else, and the games are all downloadable. Finally, even though Quest is free, it is actively supported and maintained, and it is continuing to grow and explore new directions. Need help, or got a mad idea for a project where something like Quest might be useful? Get in touch – alex@textadventures.co.uk or @alexwarren. I’m still funding Quest almost entirely out of my own pocket, and I have spent most of the last couple of years working on it, in preference to working on things that would actually earn me some money. I’m far happier alternating between Quest and contract developer work – and until I can make Quest pay for itself it’s the way things have to be, of course. But I would like to bring the two together, and work on projects where Quest forms a part. So do get in touch if you think there’s something we can work on together. Another way I plan to fund Quest is by selling additional services, and right now I’m working on some extra functionality to help schools and groups using Quest – take a look at ActiveLit for more details, and expect to hear more about that soon. My other project for the next few months is to finally build my own game. 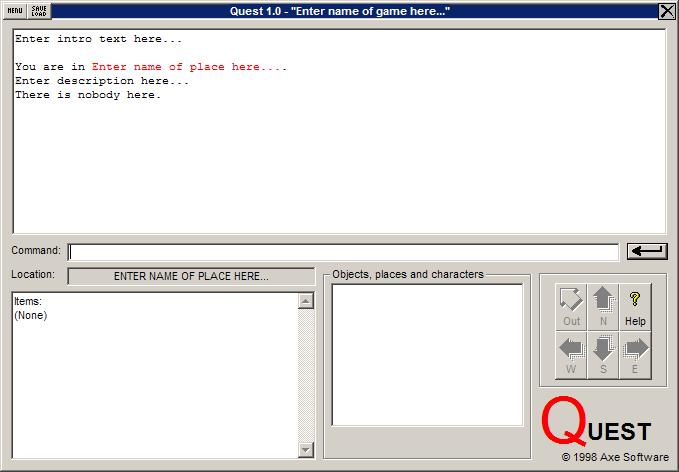 Yes, it’s been 15 years since I started working on Quest, so it’s probably about time. Although I’ve been collecting various thoughts about storytelling on this blog over the last year (see here, here and here), I’ve come to the realisation that it’s probably better to stop talking hypothetically about the kind of stuff you could do in Quest – I should show some of my ideas in an actual game instead. This entry was posted in Quest on May 7, 2013 by textadventurescouk. This version is a bug-fix release – you can see all the closed tickets on CodePlex. One very minor enhancement in the desktop version – when running a game from the editor, you now have quicker access to the HTML Tools via the toolbar or by pressing F9. Also one minor breaking change – if you have any exits that run scripts instead of automatically moving the player, you will need to tick a new checkbox on the exit editor “Run a script (instead of moving the player automatically)”. As always, if you have any questions or problems, please let me know – you can email me alex@textadventures.co.uk or find me on Twitter @alexwarren. This entry was posted in Quest on May 5, 2013 by textadventurescouk.